The popular refrain is that the constitutional debate is a ‘distraction’ from ‘bread and butter issues’. The latter phrase may prove unfortunate with the Independent reporting that hunger in Britain has reached the level of a “public health emergency” and that Westminster “may be covering up the extent to which austerity and welfare cuts are adding to the problem”. It’s clearer than ever that the Westminster consensus on social policy needs to be challenged for real change to come about. Bread and butter has become a constitutional issue, but so too has education education education. Nowhere is that divergence clearer than in educational policy and child care with extraordinary comments by Sally Morgan of Ofsted contrasting sharply with the White Paper promising “a transformational change in childcare” – effectively creating full-time childcare for all Scottish children. Morgan, a former Cabinet Office minister and policy chief to Tony Blair, called for a “big bold brave move” to target funding at educational underachievers, and the establishment of a new type of “all-through” school to educate pupils from two or three up to the age of 18. Poor under-fives are still 19 months behind their affluent peers when they start school at five. What a dire start to their educational lives. Those children have low-level social skills, especially reading and communication. They’re not ready to learn at school. Weak parenting, low educational attainment of parents, poor diet, poor housing and so on, the gap between affluent and disadvantaged is greatest in that group. Morgan said there was a political imperative to help children from poorer backgrounds, alongside Ofsted’s introduction of a tougher regime of inspection for daycare and nurseries. I think there needs to be a big bold brave move on the under-fives agenda to target funding heavily on the children who will benefit most and – increasingly I think – to look to strong providers to go further down the system. We’ve increasingly got five-to-18 schools, why not [from] three?” Morgan said, later adding: “I said three to 18, it could be two to 18 as far as I’m concerned. The comments by Morgan, who became chair of Ofsted in 2011, will fuel controversy about the expansion of schools into supportive roles that were previously the domain of parents. It sounded desperately like a sticking plaster policy covering up social breakdown. We asked a series of independent, non aligned education and child development experts to respond to these ideas. When such officials say children aren’t ready to learn what do they mean? All children are born learners. This is a social problem born of social inequalities – education alone won’t sort it out and this kind of statement puts children in deficit mode. This country needs much greater and much better informed social policy investment for the long-term. The schoolification of early childhood isn’t the answer – it just teaches small children that they have already failed. 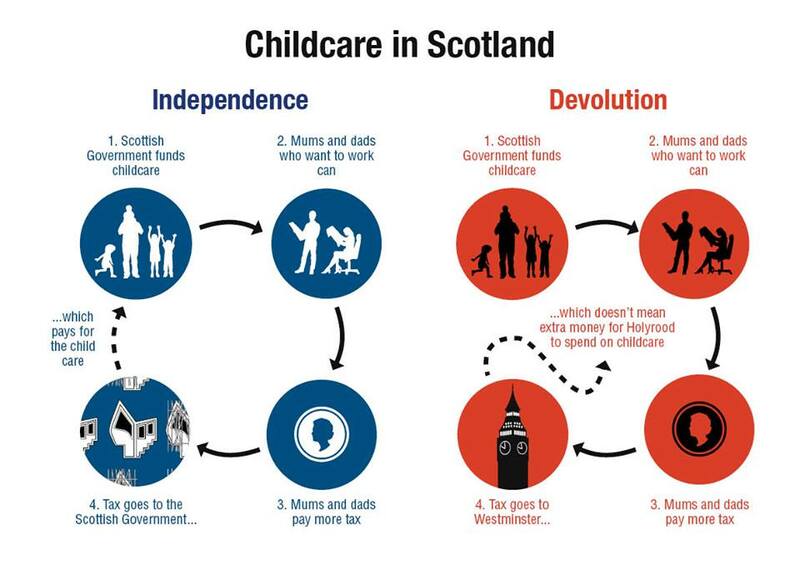 Scotland is the place to be with its more forward-looking early childhood focus. Two year olds need nurturing spaces suited to their stage of development – not classrooms and most importantly they need people who understand their stage of development and the importance of play and who will care for and educate them in small groups led by their two year old curiosity and playfulness. Young children’s brain development is enhanced by what the Harvard center on the developing child calls ‘serve and return’ interaction ie contingent response and interaction based on close relationship. Language development and social skills come from these relationships and attachment is crucial particularly for those children who come to a setting with insecure or disorganised attachment. All this stuff is unlikely to be well understood by the average primary school teacher and there are even too many people working with 3 and 4 year olds who think 2 yr olds will ‘cope’ if they put them in the same space. A 2 yr old has a third of a life less experience and maturity than a 3 and training is needed before packing ’em in and piling ’em high! Does any of this matter? Surely education as a devolved matter is sacrosanct. We can do what we want? That’s what we thought about health policies, but there are signs that Labour wants to (re) create a pan-UK social policy. That’s a dangerous thought. We have no idea of the repercussions of a no vote. But it’s clear that we need to move as far as possible from the emerging norms that characterise educational policy south of the border. This isn’t just about education policy, or childcare, it addresses deeper questions about the role of play, parenting, creativity, citizenship and gender equality. The Labour-devised/SNP-delivered Scottish Curriculum for Excellence is already modelled on Finland’s world-beating educational system. The English educational system on the other hand – with privatised academies, relentless testing and league tables – is as far from the equality-focused Nordic model as it’s possible to get. I am fed up with posh people’s idea that children should be taught or trained from as early as possible to be clever and well-behaved. They are born with creativity and humanity that such people should learn from. They are not prepared to sit in class and obey the rules until they are 8 or so. This is observed by thoughtful anthropologists in all cultures. The more technical and structured big cultures ignore common sense in favour of ambitious control, instruction and measurement of conventional behaviours and skills obeyed. They aim their utterances and resources at secondary school, which A. N. Whitehead called the stage of precision with its emphasis on discipline and “exactness of formulation”, threatening to over regulate both primary and university times of learning, and devastating the ‘romantic’ early, preschool, years (which should be 0 to 8). Educational ‘underachievers’ are often gifted learners struggling against unimaginative and ultimately unproductive facts and rules. Pre-school education isn’t – or shouldn’t be about ‘childcare’ it should be about nurturing play. As Moylett puts it: “Two year olds need nurturing spaces suited to their stage of development”. Yes the proposals put forward in the White Paper could be liberating for parents – but more importantly they could be transformative for our children. It’s estimated the plans laid put in the White Paper would create 35,000 jobs in pre-school education and nursery provision and bring Scotland into line with many of our European counterparts. If Lady Sally Morgan (and Michael Gove, for that matter) would listen to any of the researchers in early child development and early education, or at least have a look at the countries where pupils do particularly well, she would push for early years policies that encourage young children to jump, run, sing, laugh and play together. It is through imaginative play and the possibility to form loving and trusting relationships with others (not just within the family, but also with friends, carers and the wider community) that the basis for lifelong learning and success is laid – the things also Michael Gove is so keen on. It is hard to imagine this could be achieved by putting two-year olds in school – unless, of course, the whole school system was to be transformed into a big playground. …, a focus on the expansion of good-quality and affordable, play-based daycare provision (i.e. early childhood education and care services) would not only support young children’s development and learning, but also help parents stay in employment – and much more so than schools can with their rigid term and time tables. Commonweal has began to map out how a Scandic model can steer us away from a low-wage low-quality economy. It’s clear on education we should be looking to the North not to the south. Pre-school education goes to the heart of what sort of society we want to create. 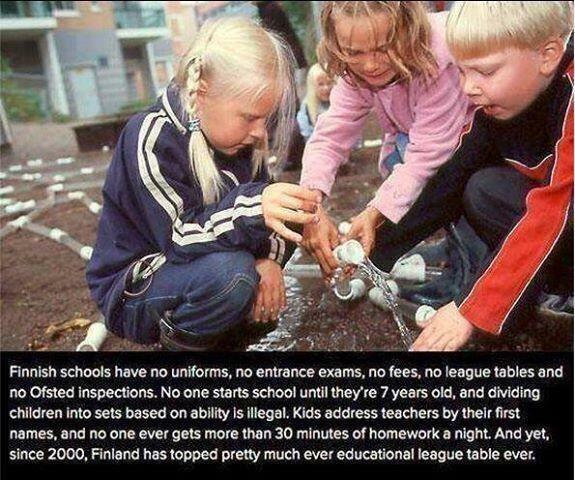 And yet, since 2000, Finland has topped pretty much every educational league table ever. Whether in itself a negative attribute of our education system, or the way we highlight the positive advantages of teaching without it. A new generation of less statistically dependent government is required. However this could be relative to population numbers and government. Singapore and Hong Kong have far lower populations than the UK and top the Pisa league table by a country mile, (along with Shanghai, 2.74% illiteracy of plus 15 years against 20% of adults in the UK). One things for sure, giving Westminster Scottish taxes is like giving the school bully your pocket money and expecting them to spend it on you. Was interested by this woodland kindergarten attached to an eco-village in Germany. The children are outdoors all the year round in this playground, and made most of the play equipment themselves. In winter it gets to below -20C! Essentially children from their birth are learning a sense of values – concepts such as those proposed in the article are a mysterious abstraction and consequently a confusing distraction to them. No doubt in time most learn the algebraic formulas that create the form of these distractions and their influence on the child’s world; but, by then its too late they’re snared. And that’s the true objective of the philistine Ms Morgan – get them young, in the corral, and under control. Major part of Scottish system is the push for higher educational standards within the workforce. Something which England and Wales are abandoning. We aren’t quite there yet as the childcare is term time only, it isn’t flexible. Fine if you can afford or find wrap around care near you for the holidays but if you can’t you’re stuffed. It’s a step forward but we still have a way to go.